Our next toy pick for the 2017 PopCult Gift Guide comes from right here in West Virginia. Lucky Cat is made by PlanetPlush, located in the beautiful hills of West Virginia, in West Hamlin, to be exact. Mrs. PopCulteer spotted Lucky Cat at the recent Mountain State Pop Expo in South Charleston, and had to have one. Lucky Cat is almost seven inches (counting the ears) of outstanding cuteness. A Siamese with round, blue eyes, wearing a real bell around her neck. Lucky Cat is the first of the Lucky Cat and Friends line of designer plush, and is the brainchild of Heather Hays, the owner and product designer for PlanetPlush. PlanetPlush sells both handmade, licensed items and original creations. Some are made by Heather, herself, while others are manufactured overseas, based on her designs and patterns. All of them are certified safe for kids, and I can tell you from the Lucky Cat that Mel purchased that they are exceptionally well-made. 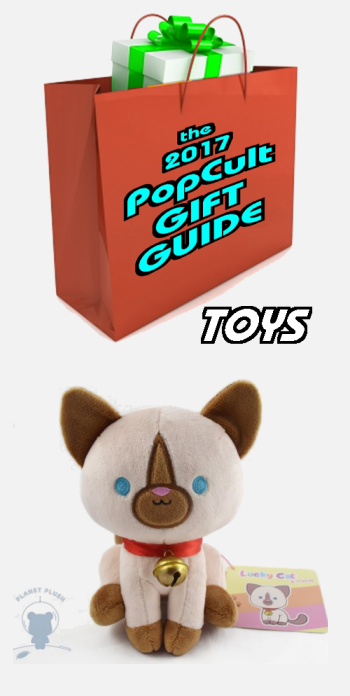 You can order Lucky Cat from the PlanetPlush website. You not only get a cute and cuddly critter, but you’re also helping to support a homegrown, West Virginia business. It’s a win-win. This is perfect for the person on your holiday shopping list who gets all weak in the knees when they see something that is just overwhelmingly cute. How can you say “NO” to this kitteh? PlanetPlush also sells premium plush of My Little Pony, if you know an MLP addict who probably needs more plush.